I Have a Delinquent Loan on My Car. How Do I Get it Off My Credit Report? There’s no reason the payment history should report you as being current when in fact there would be missed payments. To bring your account current, you would need to pay the past due amount. Then, continue to make your timely agreed-upon monthly payments. This will not remove your past delinquent history. From your description, it sounds as if the car was either repossessed, or the delinquent loan was accelerated so the full balance is due now. If the car was repossessed, then it would have been sold at auction for a low amount, and you would be responsible for the remaining balance of the delinquent loan – even though you would no longer have access to or the use of the car. I’m worried you’re confusing what you’re able to afford now with what you contractually agreed to when you financed the vehicle. Contracts are absolute. Life is not. If you’re worried about the delinquent loan being satisfied – and being reported as paid – then paying the full balance the lender is demanding in accordance with the financing agreement is the logical way. Another alternative would be to file bankruptcy to eliminate the debt and others you may have. Alternatively, you can attempt to negotiate with the lender to come to a solution you can both agree to. However, the lender has the right to stick to the terms you legally agreed to in the initial financing agreement. All of that being said, if you feel the lender has acted illegally, then you should absolutely consult with a consumer attorney who is licensed in your state. What Happens When You Are Sued by a Creditor – and Can’t Afford It? A common misconception is that sending a little bit of money will keep you out of trouble with your creditor or collector – and keep you out of court. It doesn’t and it won’t. You get no credit (so to speak) for good-faith efforts. The only payment you can make that will keep the creditor happy is at least the minimum payment you agreed to in your original lending agreement. Outside of that amount, the next payment that can keep you out of trouble is a lesser payment – but one that the lender agrees to accept. Acceptance requires an offer from you and an agreement from the lender to accept the reduced payment. You don’t get to just send what you can afford. Is your credit card debt getting out of control? Are you afraid of getting sued? Take a deep breath – we can help! You do have a very good option, but before we get into that, let’s talk about your very worst option. That would be ignoring a court summons. There’s no scenario where that works out for you. It will lead to more costs and more stress. By not showing up, you will lose by default. The creditor will get a judgment and go for a wage garnishment if that is available in your state. So first, check out the Debt.com report How to Answer a Civil Summons for Credit Card Debt. That will give you step-by-step instructions for dealing with this serious matter. So what’s that one good option? It won’t sound like one at first: bankruptcy. That’s the surest way to legally slam the door on your debt. You will be protected from your creditors, and your debt will be eliminated. Forever. Bankruptcy sounds bad because it’s serious – and because in the past, less-than-scrupulous people have abused it. But it’s also a legitimate and powerful tool for those in need. Each year, this country sees around 1 million bankruptcy filings. So where do you start? Bankruptcy isn’t something you do yourself, like a weekend home repair project. It’s akin to building an addition to your home. First, check out Weighing the Pros and Cons of Bankruptcy. Then call a professional, which is required under the law. You can reach that person at Debt.com. Identify the right solution for back taxes to end IRS wage garnishment and save your paychecks. When you have tax debt, it’s possible that the IRS will garnish part of your wages in what is known as “continuous levy.” If you don’t respond to their request for repayment, the IRS will inform your employer and a large part of your paycheck will automatically go toward your tax debt balance. They can take a quarter or more of your monthly income, which can mean heavy financial strain. Fortunately, there are many options for how to stop IRS wage garnishment. Decide which option is best for you so you can stop IRS wage garnishment and minimize the financial burden. Pay off the debt up front. If you have the means, pay off your tax debt as soon as you find out about the wage garnishment. You have to fail to reply to the IRS for the wage garnishment to start, but it’s possible you missed these communications. You can pay over the phone, by mail, via money order, or online with your debit or credit card or straight out of your bank account. This is the fastest method for stopping wage garnishment if you have the means to make it happen. If you need an extra boost to pay off the IRS, you may consider selling or liquidating an asset. If you have never promised to pay your debt in full before, the IRS may fully release your wage garnishment with a mere promise to fully pay your tax bill within 60 days. Apply for a payment plan for paying off your tax debt. An installment agreement between you and the IRS means that you can pay off all of your debt in small installments. You make monthly payments that fit your budget based on a financial statement or a fixed monthly amount for up to six years. Review the plans and start the process online or over the phone. The IRS will charge a user fee to your overall balance when you set up an installment agreement. If you are a low-income taxpayer, you may be eligible for a fee waiver that covers the user fee for your plan. Negotiate a payment plan that allows you to pay less than you actually owe. Visit the IRS website and complete the OIC pre-qualifier to see if you may be eligible to settle your debt for less than what you owe. If you qualify, it will reduce the overall amount of tax debt you have to pay back with a legal settlement. Before the IRS will consider permitting you to use an OIC, you must file all your tax returns. If you are granted an OIC, you must also stay completely up to date on your taxed for five years following. If your OIC request is rejected, you can appeal the rejection within 30 days of receiving your assessment from the IRS. Need help setting up an offer in compromise? Debt.com can connect you to a tax debt professional. Contact the IRS and explain that the wage garnishment is causing you financial hardship. If the IRS hears your story and determines that you really need the income they would take, they may stop the levy on your wages. However, this doesn’t mean that you never have to pay off your tax debt. Declaring hardship will just buy you more time because you qualify for Currently Not Collectible status. The IRS will only start collection actions again once your financial situation improves. Do your research about your financial situation before you call the IRS to make the process go faster. File for bankruptcy to get tax debt discharged. You can stop IRS wage garnishment if you declare bankruptcy. When you file for bankruptcy, you get an automatic stay that stops all collection actions, including garnishment, repossession, and foreclosure. This can result in a big hit to your credit score, so don’t take this option lightly. But bankruptcy can be a good way to get a clean break from debt, including back taxes. Read up on bankruptcy taxes to prepare for the aftermath of filing. Contact a tax debt professional to help you stop IRS wage garnishment. 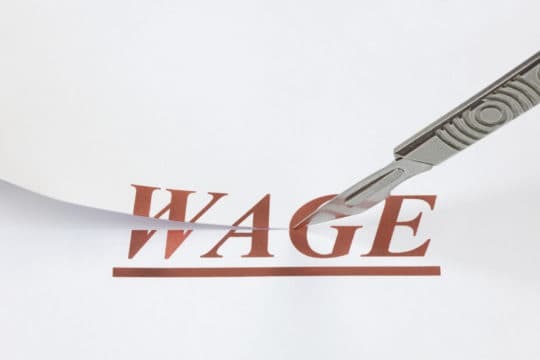 Having your wages levied is a complicated and stressful experience. 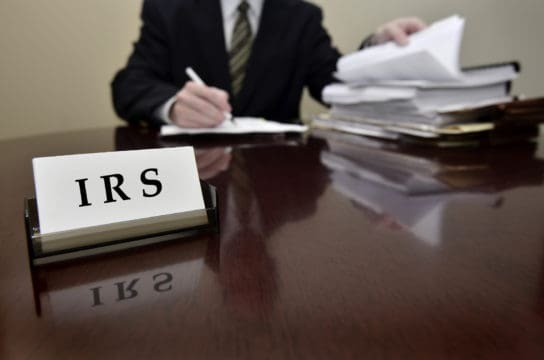 Ensure you are making the right decisions and understand all of the options available to you by hiring a professional who knows exactly how to stop IRS wage garnishment. A good tax professional will be able to leverage your financial information in a way that protects you and results in a solution to the IRS Collections problem you are facing. 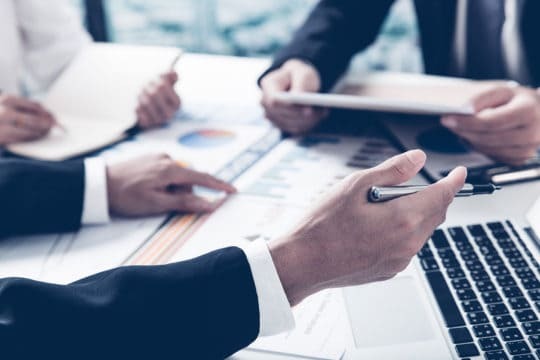 You can get a free consultation from a certified tax resolution specialist to identify the right solution for your needs. Beware of tax professionals who are not experienced in IRS collections. Debt.com can help you find the right tax debt professional for your needs. This isn’t the wisest option. In fact, most experts would say you’re crazy for trying this. But, because it takes a while for the IRS to file for wage garnishment with a new employer, quitting is a way to avoid paying your tax debt right away. Just keep in mind, the IRS will eventually find you and when they do, they will likely have less empathy. At a minimum, you’ll face higher penalties, which will only increase how much you owe. Create a game plan before you even think about putting in your two-week notice. You don’t need to do something crazy to get rid of your tax debt. 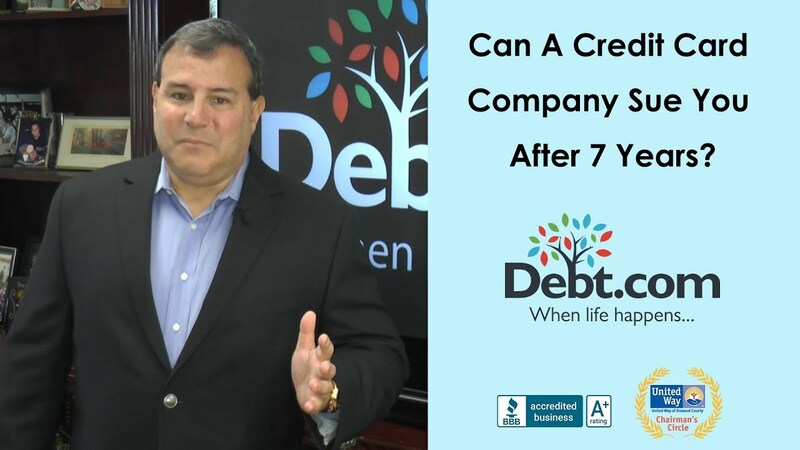 Find out how Debt.com can help you. Learn everything you need to know, from paying off IRS liens to how to remove a tax lien from your credit report. When you don’t pay your tax debt, the IRS can file a tax lien, which is a legal claim to your property. This is different from a levy, which would mean the IRS is actually seizing the property. A tax lien shows other creditors that their interest in your property comes first. What does this mean for your credit? Nothing good. Besides potentially affecting your credit score, tax liens on your credit report can make it harder for you to buy a house or get a business loan. These instructions explain how to get rid of a tax lien by working with the IRS. We also explain how to remove a tax lien from your credit report, if you still have tax liens that appear. Note on 2017 Tax Lien/Credit Report Updates: In July of 2017, the guidelines that credit bureaus follow for listing tax liens on credit reports changed. The bureaus considered a lien’s information complete when it had a birth date or Social Security number, a name, and an address. The 2017 changes mean that supplementary data is now necessary for publishing liens on credit reports. If fewer than 3 out of 4 of these data points are missing (which is the case for many tax liens) then the lien will not be present on your credit report at all. These steps will help you get rid of the tax liens still present on your report even after these rule changes. Pay off your tax debt in one lump sum or in smaller installments. This is the most direct way to get rid of a federal tax lien. Even if the Notice of Federal Tax Lien is not impacting your credit, it will impact your ability to sell or obtain property. Any time a debt exists to the IRS, there is a statutory lien in place making the IRS a priority creditor. There are a ton of options to get into an IRS program that will resolve the tax lien. Debt.com can connect you to a tax debt professional who can guide you through the process of paying off your tax debt. Estimated Time (installment agreement): Varies by program but generally up to six years. Check the guidelines for applying to have a tax lien withdrawn. The IRS released your lien and you paid off all of your tax debt. Withdraw of the tax lien will facilitate collections of the tax liability. Withdraw is in the best interest of both the taxpayer and the government. Other guidelines were created under the IRS Fresh Start initiative, which made it easier for taxpayers to repay loans. The balance of your tax debt must be $25,000 or less. You must pay all of your tax debt either before the expiration of the collection statute or within 60 months, whichever comes sooner. All of your other files must be in compliance. You’ve paid 3 Direct Debit payments in a row. You have no history of defaulting on any Direct Debit installment agreements. When you meet these requirements, you can begin the lien withdrawal process. Double- and triple-check these criteria against your personal finances to increase your chance of having your withdrawal accepted on the first try. Stuck with tax debt and don’t know where to begin? Debt.com will connect you to a tax professional who can help. Send your application for lien withdrawal to the IRS. Start by filling out IRS Form 12277. It’s a simple, one-page form. This is basically a request to reverse IRS Form 668(Y), which is the Notice of Federal Tax Lien you received when the IRS created the lien. If everything goes as planned, you should receive IRS Form 10916(c) in the mail. This form is a statement of tax lien withdrawal, meaning that the lien can officially be removed from your credit report. Make copies of the completed form or take notes during the phone call to keep for future reference. Send a letter to the 3 credit bureaus alerting them to the withdrawal of your tax lien. The three credit bureaus are Equifax, TransUnion, and Experian. To finalize the withdrawal of your tax lien from your credit report, send a letter to all 3 of the bureaus disputing its inclusion in your report. Include a copy of your credit report and the IRS Form 10916(c) that you received in the mail. Talk to someone about your tax debt today and take back control of your financial situation. Question: A friend of mine is disabled. Her only income is her Social Security disability benefits. She got into a lot of credit card debt, and one of the credit cards got a judgement against her in court. A friend told her that because of her low income, the court might just maybe forgive her debt. Is this true? And what would happen if other credit cards brought her to court? Can she go to jail because she can’t afford to pay the debt back? God, I hope not. Thank you for your help. We appreciate your kindness and your consideration with this question. Thank you so very very much. Getting out of debt isn’t as hard as you think. However, understanding how to get out of debt may be the hardest part. Debt management is a program that can cut your total credit card payments by 30 or even 50 percent by drastically reducing the interest rates. And when you’re done, you emerge with no debt and a great credit score. With debt settlement, you pay pennies on the dollar of what you actually owe. But your credit score can take a major hit, because you’re actually paying less than what you owe. Debt forgiveness means you might pay nothing on your debt, but good look getting a loan in the future. How do you decide which is best for you? Let Debt.com help you figure it out. Call now for a free debt analysis. With that out of the way, let’s talk about your friend’s debts. Yes, it’s possible your friend could have her debt wiped clean. It’s called debt forgiveness, and it’s a powerful weapon. However, like all powerful weapons, it can injure more than just the target you aim it at. That’s why Debt.com has a report called, A Realist’s Guide to Credit Card Debt Forgiveness. I urge you and your friend to read it, because debt forgiveness has gotten a bad name lately. Why? Because bad people are advertising that they can clear all your debts with forgiveness — and don’t worry, there’s absolutely no downside! It’s amazing and only we know how to do it! Of course, you’ll end up paying these middlemen a hefty fee for a shoddy service, and you might even end up worse than before you contacted them. Think of it this way: Would you pay hundreds of dollars to someone promising a guaranteed weight-loss plan that lets you eat as many cupcakes and potato chips as you want, with absolutely no downside? If you want a serious diet plan, you should consult your doctor first. If you want a serious debt plan, you also need to consult a professional. I recommend calling a certified credit counselor at a nonprofit credit counseling agency, where your friend can receive a free debt analysis. From there, all the options can be explored, from a debt management plan to bankruptcy. If you don’t know which nonprofit agency to contact, Debt.com can introduce you to a reputable one. Bottom line, Dori: Your friend doesn’t have to go through it alone. Ready to seek real credit card debt relief? Debt.com can set you up with certified credit counselors who know how to help. Question: A few years ago, we found ourselves in a very tough financial situation. So we made the decision to prioritize our bills. Unfortunately, we fell behind in our credit cards. As time passed, we were able to settle with a few of the cards, but there are a few left that are in limbo somewhere. I know of one that received a judgement against me, and I think there are two more. The thing is, I haven’t heard from them and I’m not sure what to do. File bankruptcy? Hire a debt settlement company? Or contact the creditors directly? This letter is REALLY revealing. Not for what the writer says, but because of what he doesn’t know. It’s very common for smart Americans to forget to ask basic questions. Like: How much debt do I owe? Who do I owe it to? And what’s the deadline before bad things start to happen? Look, I get it. Figuring out your finances is way down the list of fun activities. I’ve been a financial counselor and author for more than two decades, and even though this stuff fascinates me, I know other people look at budgeting like they look at flossing: It’s important, but it’s boring. Here’s the thing: No one will help you floss your teeth, but there are professionals who can help you with your finances. It is important to get a debt analysis so you can learn what you need to do. And it’s even easier than flossing, because all you do is call Debt.com. If you want to get out of debt, knowledge is powerful. My answer is going to be general because your question is general. In other words, I can’t be specific because you’re not completely sure how many credit cards you still have open, and which ones have judgments against you. That said, I can offer you one specific and urgent piece of advice: Pull your credit report. Learn how here: Where and How to Get Your Free Yearly Credit Report. However, I’ll tell you to ignore one part of the advice in that report. Because there are three credit bureaus — Equifax, Experian, and TransUnion — the law says you’re entitled to one free report from each bureau every 12 months. Debt.com and other experts advise you to pull a report from one bureau every four months. That lets you notice any irregularities in a timely fashion, then repair your credit either by yourself or with the help of others. In your case, I’m advising you to pull all three reports right away. Your priority is finding out exactly what you owe and to who — and soon. I’m concerned that you “think” you might have more judgments against you. So I also urge you to contact your creditors right after you pull your credit reports. Rest assured, if you owe them, they’ll be able to tell you. In these cases, I sometimes hear this faulty logic: “Howard, they haven’t contacted me, so if I ignore it, I don’t have to pay!” While it’s true that there’s a statute of limitations on credit card debt, playing that waiting game is dangerous. First, each state has its own rules, which you can see on this map. Right now, I’d recommend against debt settlement, which has its own set of drawbacks. While you need to pursue bankruptcy at some point, that’s the very last step. Your first ones are to simply gather all your facts. Once you do that, I’d consult a certified credit counselor for a free debt analysis. 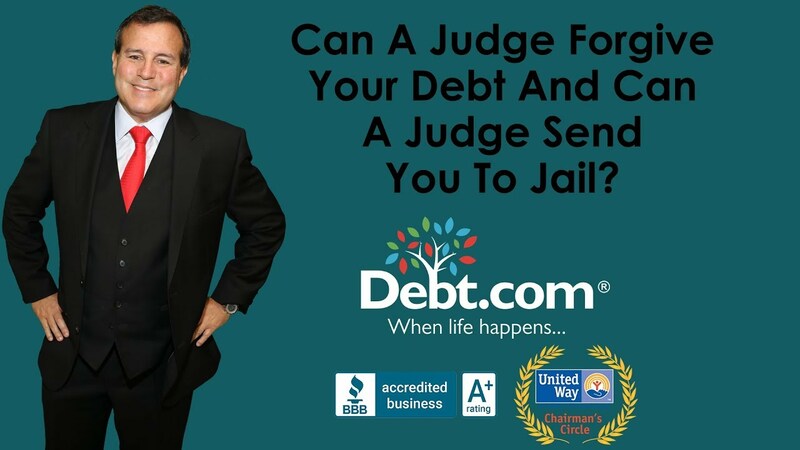 You can reach one by calling Debt.com at 855-996-9980. If My Husband Owes Taxes Do They Come After Me? Question: I have a home and other assets. I recently married and then found out my husband had not filed taxes for 10 years — and owes the IRS $38,000! Is my home, bank account, and assets subject to a lien? Are they at risk? If my husband owes taxes do they come after me, even if he incurred the debt before we got married? If my husband owes taxes do they come after me? A reader doesn’t care about her husband’s old flames, just his old bills. Three of the happiest words in the English language are, I love you. Three of the absolute scariest words, Internal Revenue Service. When you combine them it can get really confusing. Some of the trickiest financial questions I’ve ever heard were from spouses stuck in tax disputes. Tax problems are complicated enough when one person is involved. When it’s two spouses filling jointly it’s the difference between walking a tightrope and walking a tightrope while giving someone a piggyback ride, and don’t get me started on community property estates. 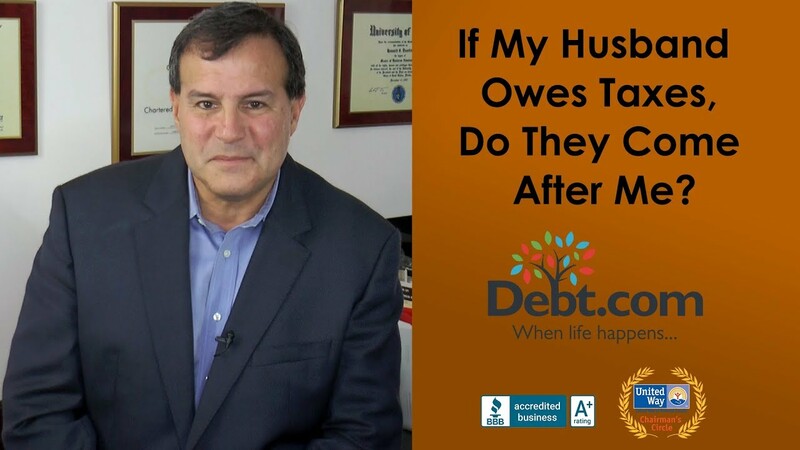 For that you need a read my much longer answer to Deborah on Debt.com and check out our section titled, “If my spouse owes back taxes and I liable?”. This is a good time to remind couples who aren’t yet married, but are planning to sit down together and make a list of your finances. I’m talking the good, I’m talking the bad, and I’m talking the ugly your assets and your debts. I’ve always said the best way to deal with the IRS is to never get on their radar. If you want advice for how to budget so you don’t get in trouble consult Debt.com before you say I do. Even though I’ve been a CPA and financial counselor for more than two decades, I prefer to consult tax experts on questions like these — just to confirm I’m right. In this instance, my instincts proved correct, says Don Markland, chief revenue officer for the Tax Defense Network. 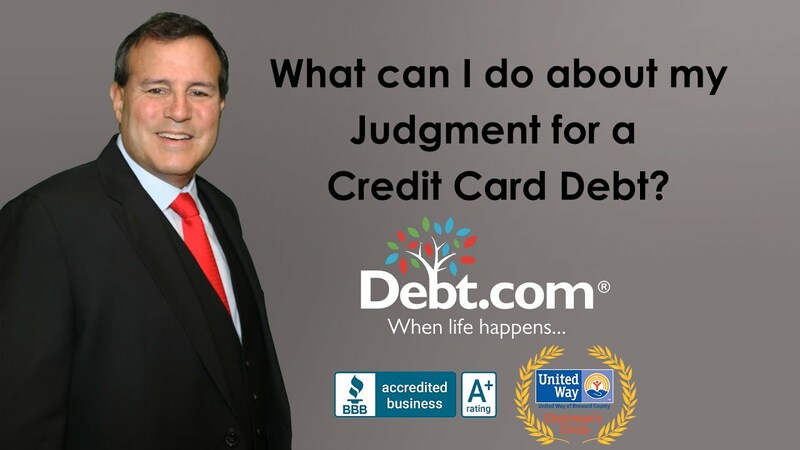 Debt.com partners with Markland’s firm because of its experience and adherence to Debt.com’s Code of Ethics. The easy answer is yes, Debra is liable. Texas is a community property state, and debt created during the marriage is owed by both spouses. Of course, when it comes to taxes, nothing is easy. So let’s break it down. What about before the marriage? “Generally, premarital assets are not community property and can be protected,” Markland says. Please note the word generally. That’s because other factors come into play. Here’s just one, Debra: Are you filing jointly or single? “This will greatly influence your returns,” Markland says. First, you should read the Debt.com report that touches on this very topic. It’s called If My Spouse Owes Back Taxes Am I Liable? Because tax issues are complex, and because you live in a community property state, you need to consult an expert. Whenever I tell people this, they usually express fear: How much will this cost me?I tell them: You will indeed pay a fee, but if you consult a reputable expert, it’s almost always less than it would cost you to try it on your own — and always less than the cost of ignoring the problem until it catches up with you. Question: What does it mean that a credit debt is no longer collectible? My father is now in a home, and when I went through his financial records, I found he owed nearly $2,000 on a credit card from the 1990s! Does he still have to pay that? He says he doesn’t, but he’s also suffering from some dementia. Will I get stuck with this bill, since I’m now taking care of him? My mother died a few years ago, and I’m an only child. The answer is simple: Your father owes nothing. The explanation behind the answer is a little more complicated. I’ll describe it like this…. Let’s pretend we’re peering into a crystal ball and viewing your father back in the 1990s. He has run up $2,000 on his credit card and has simply ignored his statements. What happens next? If you want all the gory details, read Debt.com’s report, What Happens If I Stop Paying My Credit Cards? I’ll cut to the chase: Six months later, after his credit card issuer has asked nicely and sternly to please pay what you’ve already spent, the entire amount goes into collections. So when is a debt no longer collectible? Debt collectors have a dark reputation, and rightly so. It’s a tough business, and unscrupulous collectors were so pervasive, the federal government passed a law to protect us from them. It’s called the Fair Debt Collection Practices Act. Luckily, it was passed long before your father stopped paying his credit card bill, so he was protected by it. Suppose your father’s debt went into collections even as late as the end of 1999. If it wasn’t paid by the end of 2014, it’s now “time-barred.” That means your father can’t be sued to collect the money. It’s as good as gone. This all sounds like good news, but I’ll give you this warning: Review your father’s financial records carefully. In my experience, someone who ignored their credit card bill until it went into collections probably didn’t stop there. He may have more recent bills that also went unpaid. Depending on their dates and dispositions, he could still be pursued by debt collectors. I’ve heard of collectors targeting the children of infirm parents, hoping to scare them into paying. You need to know your rights. Check out Debt.com’s Debt Collection report before responding. Can A Credit Card Company Sue You After 7 Years? Question: I was reading on the Internet that if I don’t pay off my credit card bills in seven years, it’s too late for the credit card companies to sue me for not paying. it’s like the statue of limitations for certain crimes. You’re off the hook. My wife says that’s crazy and wants me to consult an expert. So that’s why I’m writing you. Is this real or not? I hope it is, because I got something like $12,000 or $13,000 on seven or eight cards. It might even be more now. Questions like this one both sadden and frustrate me. I hear them frequently, and I always reply the same way: A little knowledge can be a dangerous (and costly) thing. In this case, Pete, you and many other people are confusing two different concepts. First, there is a time limit regarding these debts. Second, it’s called a statute of limitations. Third, it’s not what you think. Can a credit card company sue you after 7 years? Credit cards are very complicated and so is the law. When you combine those two things you could easily get overwhelmed. That’s why this question about the statute of limitations is so important. Here’s the problem, there are dozens of statutes of limitations, each state has their own. They determine how long the collection agencies have to sue you for not paying your debts. After that time, they can’t take you to court, but they can keep bugging you to pay up because your debts haven’t disappeared. Then there’s the Fair Credit Reporting Act, a federal law that says many things, but one of them is this: “most negative items on your credit reports must be removed after seven years”. So again, the debt is still there but anyone pulling your credit reports won’t see it. I wouldn’t recommend waiting around for years hoping you won’t get sued. That’s a stressful way to live and if you do get sued you could end up getting your wages garnished. Your best bet is to call a professional now for a free debt analysis. Who do you call? Debt.com of course! If you’ve stopped paying your credit card bills, your card issuer will probably sell your debt to a collections agency after six months. That agency now has as few as three years and as many as 10 years to take you to court and sue you for that debt. Why the big range of years? Because it depends on which state you live in. Each sets its own rules, and those rules can vary in the details. Thus, it’s impossible for me, in this limited space, to list all the variables. Debt.com assembled this report, which has an interactive map that shows you all the complicated details by simply rolling your mouse over your state. Now, just because you can no longer be sued for your debts doesn’t mean they’ve gone away. They’re still there. The reason you’re probably citing seven years, Pete, is yet another rule. This one comes from the Fair Credit Reporting Act, or FCRA. This federal law states that most negative items on your credit report must be removed after seven years. That doesn’t mean collection agencies won’t still hound you. While they can’t bother you at all hours or make threats — thanks to another law called the Fair Debt Collection Practices Act — they’re not likely to ignore such a large sum. As you can see, you’re risking a lot by ignoring your debts. If your creditors do sue you, and if they win, you could face wage garnishment. While that’s an extreme, read What Happens If I Stop Paying My Credit Cards? to learn all the scary possibilities. Before you play chicken with your credit card issuers, Pete, I recommend something else. It won’t cost you anything but some of your free time: Get a free debt analysis from a certified credit counselor. Learn more here. Pete, you might find you have far better options than living several stressful years waiting and wondering if you’ll get sued. Can The Government Garnish My Wages Till I’m Broke? Question: I just received a letter stating my student loan that has been in default is to be offset. I am working. I’m also already facing wage garnishment for child support arrears. I barely make $11,000 a year and they garnish $300 each month for my arrears. My question is: Can the government garnish my wages at the same time garnishment for my arrears ? Or will they wait until I pay my arrears off? If they don’t do that, I won’t have anything left to live on! You are living through a tremendously stressful situation, Angie. I wish I could wave a wand and make that pressure vanish. What I can offer you is good information and a plan forward. An offset is typically a tax refund intercept, unless you’re also getting federal benefits like Social Security. The tax refund intercept is easy to deal with — just don’t get a tax refund. You should adjust your withholding, if any, to get more money in your pocket each month and not in a refund check. Thus, you can avoid the IRS intercept and you’ll have more money to cover your expenses each month. Now that’s a short-term solution. For more of a long-term solution on the federal loans, you can get into a $0 per month payment plan that will keep you out of default. In fact, I just recently answered a reader question that dealt with this. I’m not an attorney. You’d need to speak to an attorney licensed in Texas for specific legal advice, but it appears in Texas you can have up to a wage garnishment that’s up to 25 percent of your disposable income — but not more than 30 times the minimum wage. If you did get a federal student loan wage garnishment, it would come in the form of a letter and be called an “Administrative Wage Garnishment.” Open it. The letter will instruct you how to appeal the garnishment to hopefully get it suspended. Texas will allow you to modify your mandatory child support garnishment if you can demonstrate the garnishment doesn’t allow you sufficient income to live on. To modify the garnishment, talk to the court or a licensed attorney in Texas. Another solution may be to look into debt consolidation, which can include child support arrears. Thank you for letting me help you find a way forward, Angie.